See our Tru-View-XL 3 sided electric fireplaces. Form meets function. Fire becomes art. 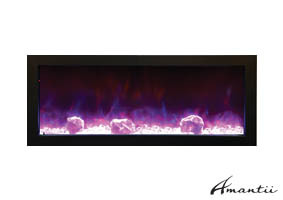 Amantii’s electric fireplaces are perfect for homes, offices, restaurants or commercial settings. 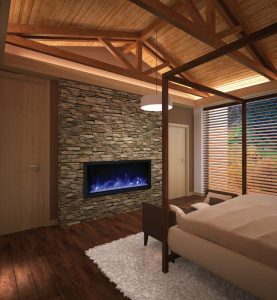 The clean, contemporary design of the fireplaces, along with the features such as mood-setting back-lighting, or design finishes, provide unlimited creativity and versatility for designing any interior space. 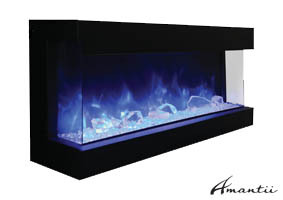 Also, our out-of-the-box system makes it easy for you or your builder to install an Amantii fireplace in no time! Our commitment to quality and customer satisfaction is something that doesn’t end when your fireplace order ships. At Amantii, we are honoured and proud to provide valued customers with a high-quality product that combines modernity, sophistication and traditional comfort all in one, paired with premier service and support. Check out our latest Fireplaces – XT DEEP!